A quick & delicious meal grilled fireside. Perfection! Heat grill to medium-high. Brush chicken with 1 tablespoon of oil and season with salt and pepper; set aside. In a bowl, toss the onions and peaches with remaining olive oil and season with salt and pepper. 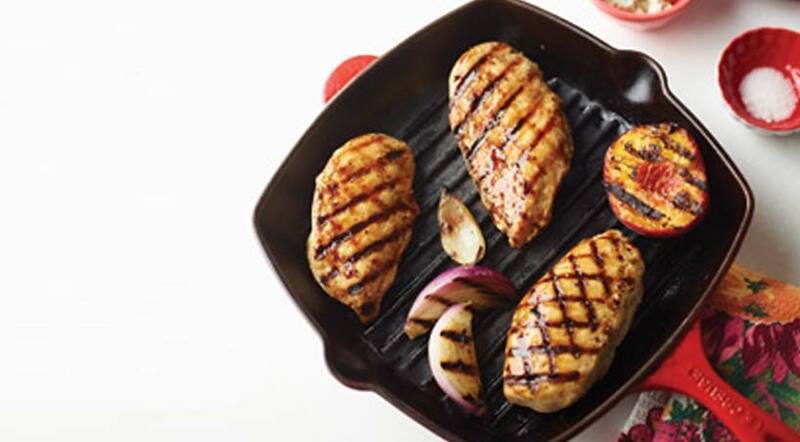 Place chicken and onions on grill and cook for 2 minutes; rotate 90 degrees and cook for another 3 minutes. Turn breast and onions over and repeat process. Remove chicken and onions from grill and cover with foil to keep warm. Grill peaches, flesh-side down, until charred, 2’3 minutes. Scatter arugula over a serving platter. Place chicken over arugula and top with onions and peaches. Sprinkle cheese and drizzle balsamic glaze overtop and serve. 197 calories, 8 g fat, 83 mg calcium, 119 mg sodium, 9 g carbohydrates, 1 g fibre, 21 g protein. Excellent source of vitamins B6 and K, niacin and selenium. Source of vitamin C, calcium and iron.